Director: Ridley Scott; Format: VHS; Rating: PG-13; Release Date: August 1996; Sound: DigitalSound, SurroundSound, Closed Captioned; Length: 129 minutes (Color); UPC: 786936669831. Condition: Good. Blockbuster PVT with usual stickers on tape and back of cover. Some outer signs of use, but cover is still in overall good shape and tape plays well. Same cover design as that shown here. Eclectic director Ridley Scott here tries his hand at a coming-of-age tale, which stars Jeff Bridges as ship captain Christopher Sheldon. 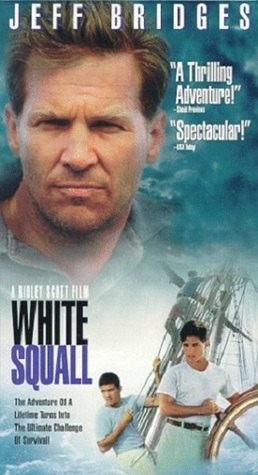 Based on a true story, the film is set in 1960 as a group of teenaged prep students signs on to Sheldon's floating summer school, conducted on a two-masted brigantine bound for South America. It soon becomes clear that the gruff but humane captain runs a tight ship as he drills his neophyte crew on the importance of teamwork and discipline. The boys possess a wide range of temperaments--there's the bully, the daredevil, the one plagued by insecurities, the one with demanding parents. Sheldon uses the shipboard chores as tools for dealing with their problems, reining in the obnoxious and encouraging the anxious. Since they are, after all, sailors, they also get a chance to get drunk in port and stop over at a whorehouse. Finally, the crew must confront the fabled white squall, a deadly storm so rare that even Sheldon has never experienced one. Bridges, Ryan Phillippe, Balthazar Getty, and Jeremy Sisto give fine performances in Scott's film of spectacular visual beauty.